The only thing that gets me out of bed early on a Saturday is the Downtown Farmers Market. I’d like to believe that everyone who lives in Salt Lake has been, but if you haven’t, you are truly missing out. My strategy for the market is to go as soon as it opens and escape before the midday sun. If you’re a late starter or more of a browser I would recommend wearing very little clothing because this summer is a hot one. At 9:30 I felt like Will Ferrell in Anchorman, except my exclamation was, “Black was a bad choice!”. Don’t worry there is plenty of popsicles, fresh lemonade, and iced coffees. Bring cash and small bills, although ATMs are available, it’s best to avoid the lines and the fees as well as the merchants’ occasional inability to break the sea of $20 bills that come their way. Bring your own bags or a cart/ wagon for melons or potted plants or any number of heavy things you might want. The earlier you arrive the better. Midafternoon is like black Friday for veggies. Also, in the earlier part of the day you don’t have to maneuver around dogs and strollers. If you have a dog or a stroller later in the day is a perfect time to people watch and socialize. Cherries for $2 a pound! No more stealing single cherries at the grocery store and wishing you didn’t have to pay ten bucks for a bag. 6” potted herbs for less than $3. Herbs at the grocery store remind me of the Beta fish at Walmart, sad and either over or underfed. The herbs at the market are robust and cheap. 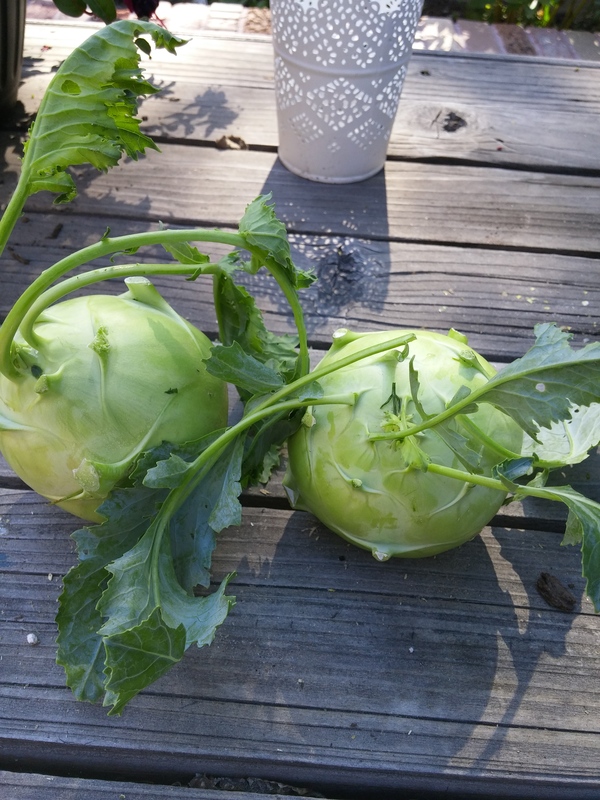 Kohlrabi is one of Yeti’s favorite veggies and it is cheapest at the market. Try it, It looks cool and it sounds fancy. I bought these from a boy that looked sad and bored. He was almost scared that I was actually buying something. Don’t shy away from the less crowded tables. The absence of a crowd is the perfect opportunity to talk to the farmers and ask questions. In this particular case I left the boy alone to return to misting the beets. A medley of lemon spinach and extra spicy arugula from Chad’s. The mix is going to make a perfect salad to accompany some grilled shrimp. The greatest thing about the farmers market is that you’re able to try a lot of the produce before you buy it. I will bring my knives to get sharpened by Lorenz. I have a rough time cutting tomatoes which means my knives are in bad shape. Dull knives are more dangerous than sharp ones so I really need to take care of that. Reggie’s Southern Hospitality. Jambalaya is my southern food weakness. One con about going early was that the huge pot of steamy goodness wasn’t quite ready. 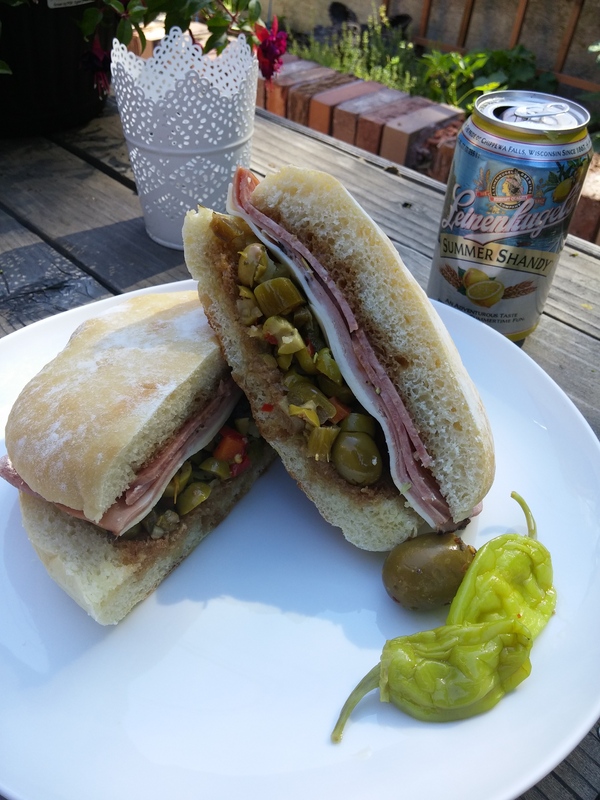 Until next time, I purchased a Muffaletta at Tony Caputo’s Deli to satiate my Louisiana fare craving. The muffalettas at Caputo’s are the size of your face which reminds me of a rumor that I heard about a place in Louisiana that makes them the size of pizzas and they are sliced to order. Hmm… something to dream about. Lamb bacon. I wasn’t sure what I would do with it, but I want it. If you have any ideas comment below and I’ll buy some next time. Don’t let the heat and the crowds deter you from shopping at the market. The visit is always worth it when you can reward yourself with farm fresh eggs, homemade butter, and handmade pasta. You can essentially do all of your grocery shopping at the market with the availability of fresh baked breads, organic meats and local cheeses. 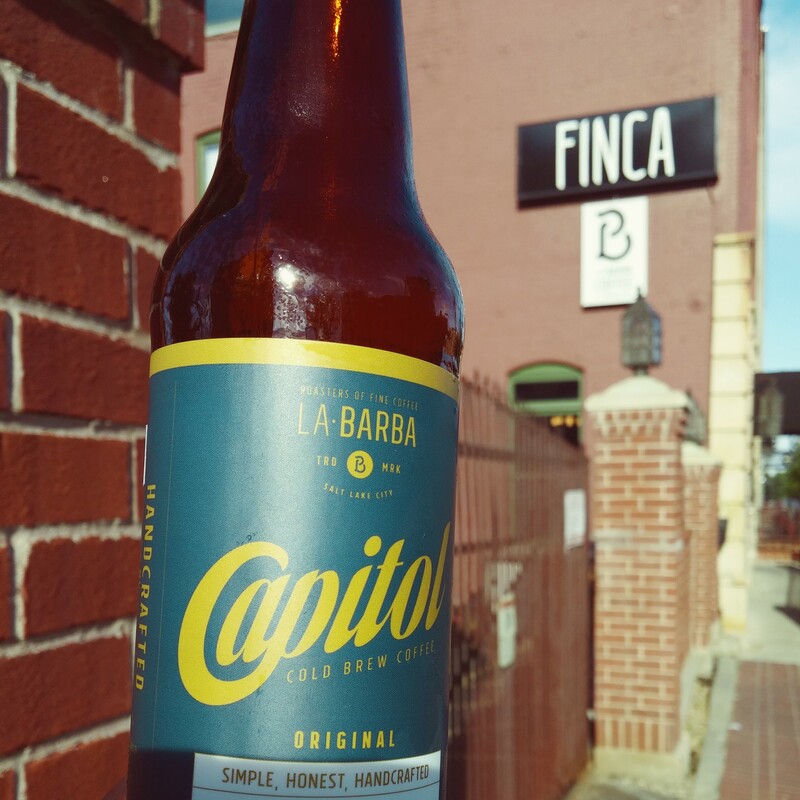 This week I stopped a block away for a bottled cold brew coffee at La Barba inside of Finca. I discovered later that Charming Beard also has a spot at the market on the south side. This was my first bottled coffee experience and it was excellent. I love Charming Beard’s smooth bold roasts and their cold brew method leaves no room for bitterness. Although, I couldn’t shake the feeling that some people at the market thought I was drinking beer. I can only assume that their sideways glances were jealousy. As soon as I got to the market I made a beeline for Pierre’s Bakery for a salted caramel croissant. I always buy the same thing even though the rest looks tempting. The croissant is made from triple turned croissant dough which makes it denser. 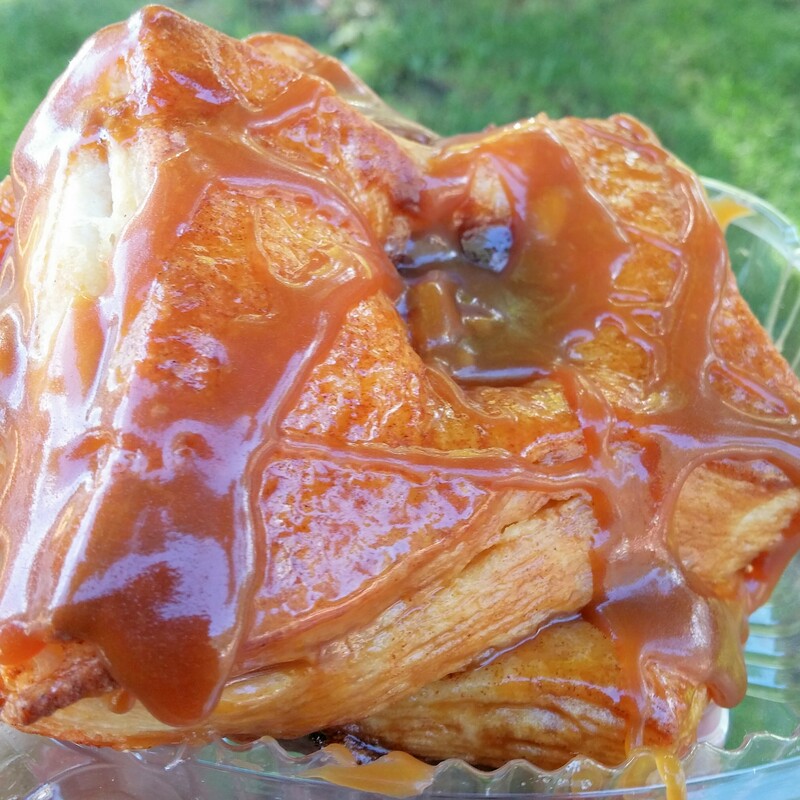 Each croissant is dipped in made from scratch caramel and left to sit and absorb until they are sold, then they add an additional helping of toasty and delicious caramel. I took a bite and then put it away so that I could enjoy the messy delight in the privacy of my own home and lick the box without outside judgment. There’s still time left. The Market closes at 2pm. If you miss this one, there’s always another every Saturday until October. Have a delicious weekend!